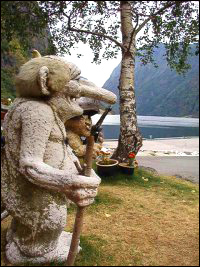 People come to Northern Norway not only for the auroras and to see its Arctic landscape, but also to hunt for trolls, the mythical creatures rumoured to hide in the forests and mountainsides. These “nordmenn” (men of the north) are generally believed to have supernatural powers and offer good luck. Supposedly, trolls are as blind as a bat and can’t see their own hand in front of them. Legend says the worst thing you could do near a troll is to be happy; they hate happiness and things that make people happy. So we have to be careful to not make a troll mad. Trolls can only come out of their hiding-places after sunset and they disappear again before sunrise. Most trolls live to be hundreds of years old and there are plenty of rock formations with troll-like features. In fact, legend says trolls hate daylight and if they are caught in the sun, they turn to stone. Direct exposure to the sun can cause them to crack, turn into stone and possibly burst. Because of their extremely shy nature, ability to transform themselves and other supernatural skills, they continue to fascinate visitors from generation to generation. After three days of travelling from the capital Oslo to Trondheim and passing through Bergen, also known as the city of fish, we had not seen a troll. But on the other hand, we could see the spectacular panorama of the fjords. In Norwegian, the word “fjord” means “bay that penetrates inland.” The North Sea coastline breaks inland in a highly complex manner creating the landscape. We took a boat in order to cross one of fjords we encountered on our way. The colours are very strong as if they had been painted, and the only sounds we hear are from gulls that get close enough to eat breadcrumbs from our hands. Fjords appear to be lakes, but they are actually a marriage of enormous mountains and ocean that seem to be waging an eternal battle below. It’s not summer, when 24 hours of daylight can be fully exploited for activities, but it’s not yet winter, when we could see the unique show of aurora. The street has a lot of bends and hardly any other cars were on the road. Eventually we arrived at a surreal wilderness with calm lakes and ice-mountains. We stopped the car and got out. There were no sounds, people or animals. The air was cold, but had no humidity. Our mobile phones were out of range. It seemed to be on another planet.